New Principal Zachary Rahn is leading the rebirth of a once-failing school. Students address 28-year-old Ashley Elementary principal Zachary Rahn with a combination of respect, affection and enthusiasm. As they show him their latest drawing or maybe their shiny boots, he, in turn, addresses them by name, sharing their excitement over whatever they are doing at that moment. Rahn is a whirlwind of energy, enthusiasm and confidence that’s infectious. And now there’s a positive energy coming from each classroom that the community wasn’t so sure would be there this school year. In fact, for a while, it looked like the school itself wasn’t going to be there. Zachary Rahn greets every child at the door each morning and assesses how he or she is doing. Rahn was hired in late May. “With great enthusiasm, and a significant grasp of effective academic curriculums, Zach gathered about 20 shell-shocked teachers and principals (from other schools) to write a new school plan for Ashley,” says Haddon. Despite his youth, Rahn came with years of practical experience as a teacher, then an advisor for Teach for America, and as assistant principal at Cole Arts & Sciences Academy. Rahn was also armed with a list of lessons learned from successful schools. Ironically, when the Ashley opportunity arose, Rahn had just been offered a principal position in Boston, closer to his New England roots and his family. Torn between selling his Clayton neighborhood house, packing up his dog, Wallis, and heading back East versus the prospect of creating a high-performing school at Ashley, Rahn called his dad for advice. His dad, who had been a physical education teacher for 34 years, encouraged him to take the job, saying “You need to do this. It’s going to be more rewarding. We’re proud of you.” Rahn accepted the position at Ashley and started working to not only revamp the school, the curriculum and procedures, but he got DPS to improve the building, including painting the dingy, yellow walls bright white with colorful stars. In July, he went back home to visit family and spent time lobstering with his dad. The day he returned to Denver, his father died while scuba diving for lobster traps. Rahn immediately returned home and stayed until just before school began. The compilation of ideas for Ashley’s transformation came from the commonalities Rahn found in the successful schools across the country that he visited as part of a principals’ leadership program through the DPS Office of School Reform and Innovation. To jumpstart a successful academic career, Ashley offers Early Childhood Education. To be more efficient going from one class to another, students follow lines on the floor—an example of how Ashley manages time carefully. Ashley is using blended learning, offering technology in every class. While Ashley has necessary regimentation, the staff is comforting and provides a warm atmosphere for students. Those commonalities included a two-teacher per classroom model, blocks of instruction for core classes, a structure for every system in the school from how Morning Meeting runs to how the students maneuver the hallways to the dismissal process at the end of the day. Rahn acknowledges that the degree of structure has been a concern among parents, but when they see what Rahn refers to as the “Joy Factor” in the classrooms and parents see improved behavior and enthusiasm for school from their children, they are on board. Rahn also found the successful schools he visited had a specific “culture,” which he says stems from the leadership and teachers. He feels Ashley’s culture is “warm and welcoming but with clear expectations and learning time that is completely maximized.” He also witnessed blended technology (the incorporation of technology in every class) and unique administrative positions to support the school’s mission. To assist in the goal of those last two items, Colorado Studios’ owner and founder Philip Garvin, a longtime advocate for Ashley Elementary, committed to purchasing iPads for every first- through fifth-grade Ashley student to use in school and at home, making Ashley the first DPS elementary school with a 1:1 student-to-technology program. Rahn offers scenarios of students using iPads to track their fitness levels in gym class, taking photos of their artwork and uploading it to an online portfolio in art, communicating with other students about projects and teachers being able to see each night where individual children need help the next day. It will also assist with making sure every child is bilingual by the time they leave fifth grade, one of Rahn’s goals. Garvin is also committed to paying for a “dedicated and knowledgeable” Blended Learning Coach and Coordinator at Ashley. That position is one of the unique ones Ashley will have, along with a Dean of Culture and Director of Operations. Rahn feels those support systems, together with an advisory board, will enable him to focus on providing the best instruction for the students, which he calls a principal’s most important job. Rahn’s goal is to enroll 100 percent of the students who live in the school’s boundary. Currently, he has 71 percent and the DPS average is 81 percent. “Historically, the school hasn’t provided a good educational choice so parents rightfully went elsewhere,” he says. His recruitment goal is to bring those students back and to grow the school to have three classes at every grade level. Zach was a great student and his personality was infectious. The school and community has a wonderful principal. I have known Zach most of his life and enjoyed being his teacher. Now I enjoy being his friend and seeing him do so well. My best wishes to all and especially the students who are lucky to have Principal Rahn. As an interested community member, I have followed Ashley for years. I wish the absolute best for Ashley and some of the changes sound promising. Certainly, one would expect two teachers per classroom and the influx of technology (though beware, I have seen the influx of IPAD's at another DPS school only result in reinforcing technology for fun and games) will have positive results for this school. However, like others in this conversation, I take offense with the superficiality and shortsightedness, which sadly is typical of DPS and the status of urban education reform in our country, as well as your author. Though I appreciate a nice paint job as much as the next person, this hardly would weigh in as a sign of a promising leader. 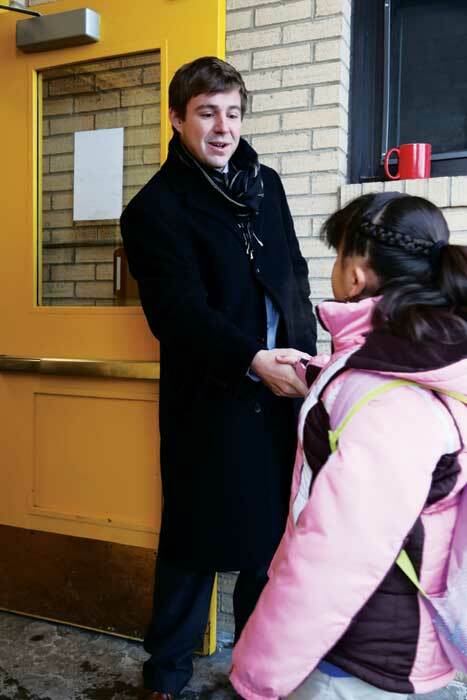 Getting to know students (beyond superficial daily greetings), as well as parents, staff and the community would! In DPS these days money goes to the poorest performing schools (rightfully), but is temporary and, any positive results don't show up in other schools. DPS is lucky to get so much money flowing in. I guess it is an ideal urban community. However, you never see the programs outlive the money or the success stories (isolated charter or traditional schools) successes being replicated in other equally lacking DPS schools!. Finally, I did see data that clearly demonstrated that Ashley was making promising gains last year, within the old structure. Interesting timing for a principal firing and major changes, I thought. It, obviously, is too early to evaluate the results of these new changes and doing so is ridiculous, particularly lacking input from the key stakeholders (students, parents, staff)! Like I said, I hope for the best for the Ashley community…..as well as all of DPS! As a doctor, I can tell a puff piece when I see it. This article is so puffy that you could put it in a pillow case and sleep on it. I absolutely love this school for my son. & love the energy of the teachers & principal. I also love the morning meetings and how they all work together as a community! I will continue to have my son in this school even though we live in the cherry creek school district! It’s totally worth it! Where are the interviews with parents and teachers? This article comes off as a piece that was encouraged by the recently hired marketing firm for Ashley Elementary because these interviews are missing as is research into what defined the school as "failing". As a parent of children who attend Ashley Elementary and have excelled there, for years, I was happy with Ashley in previous years. Last years test scores came back after the principal was fired and the increase was staggering. Given this fact and the fact that the extra funding from DPS, didn't come in until the end of the last school year, the bias in the above article is incredibly evident. While school reform is difficult to understand, there are many layers that need to be considered. Turn Around affects all stakeholders, from community members to the most important ingredient, the students. Many children come to school prepared to learn, and others struggle. The struggling population, like the prepared, deserves everyone to take a closer look and demand excellence from the members of Ashley’s staff. Bravo to EVERYONE in the building that has stepped up and made change happen, which began last year when the Ashley family was given a large task. It sounds like the work continues under the collective new plan and leadership. I found teacher and parent testimonials on Ashley’s website. Thanks to Front Porch for highlighting the work at Ashley! Well deserved! This issue, though, is that the scores of the tests, from last year's leadership, indicate that the staff had already begun to make the change happen. This indicates that the improvements are less reflective of the new leadership and new plan than is implied in the above article. Testimonials presented on the Ashley website prove very little, much like the lack of interviews in the puff piece presented by The Front Porch. The website was assembled by a marketing firm, whose job dictates that only positive elements are shown. This article reads as if it was created by the same marketing firm. Editor’s Comment: We appreciate hearing all opinions and do understand that there were many parents who liked the prior principal and felt he was moving the school in the right direction. However, with our space limitations we couldn’t tell two stories, and this article was about what we saw when we visited the school. It was not a survey of parents, which, at any school, would cover a range of pros and cons. We would be happy to print letters to the editor that offer parent opinions about the current program or about the prior program. This article about the school and about Zach, Mr. Rahn was fabulous. Congrats to all who worked so hard to make this school a success. I know your dad is looking down with that fantastic smile of his. Good luck to Zach and everyone else for all of your hard work.